This little moth orchid has come back into bloom after many months of rest in the windowsill. Moth orchids, easily found at Trader Joes and some other groceries, are relatively easy house plants. You could not have convinced me of that several years ago. Years went by when I admired orchids, but wouldn’t bring one home. I assumed that something so beautiful and exotic looking needed specialized care in a greenhouse from a master gardener in order to survive. I credit Trader Joes, and their continual display or beautiful orchids right inside the door, for giving me the confidence to try growing my first Phalaenopsis, or Moth orchid, several years ago. Since orchids of all colors, sizes, and varieties are right there within sight of the coffee and bananas, I finally chose a beautiful little purple orchid, in a 3″ pot, priced at just under $10.00. I brought it home very gingerly, holding it to protect the flowers, and immediately went to the internet to research the finer points of its care. I even ordered Steven Frowine’s Orchids For Dummies somewhere along the line to make sure I didn’t miss any crucial tidbits for keeping my little orchid alive. And I learned…. it’s just not that complicated. This moth orchid is an epiphyte, living naturally high in the canopy of a rain forest, and so it grows aerial roots which can absorb moisture directly from the air. The silver green roots on this mature plant have grown quite long. A new bloom scape is growing, covered in tiny buds. Moth orchids are epiphytes, living in the branches of trees in tropical forests. Most of these orchids originate in tropical China, India, Papua New Guinea, and tropical areas of Australia. Taiwan has a huge nursery trade in orchids, but more and more are propagated right here in the United States, which is one reason the price has come down and the selection increased. Knowing that orchids live in the canopy of rain forests tells us they don’t need much room for their roots to grown in a pot, they like heat and humidity, and they are naturally tough plants. For all the delicate beauty of each blossom, these flowers are much sturdier, and longer lasting, than most other flowers we might buy on a potted plant. An individual orchid blossom can be expected to remain beautiful for several weeks. The spray or flowers may remain in bloom over a period of months. Although an orchid may bloom for months, once the bloom is finished, the plant will require a long rest. An individual plant may only bloom once or twice a year, if that. Coaxing an orchid back into bloom can take some effort, which is why many people quietly discard their orchid once the blooms fade. I’ve never easily discarded a plant, especially while it is still alive, and so I simply move the orchid plant and continue caring for it when the blooms fade. And by doing that, I’ve learned that the moth orchid will rebloom, if I’m simply patient and allow the plant to recover its energy. 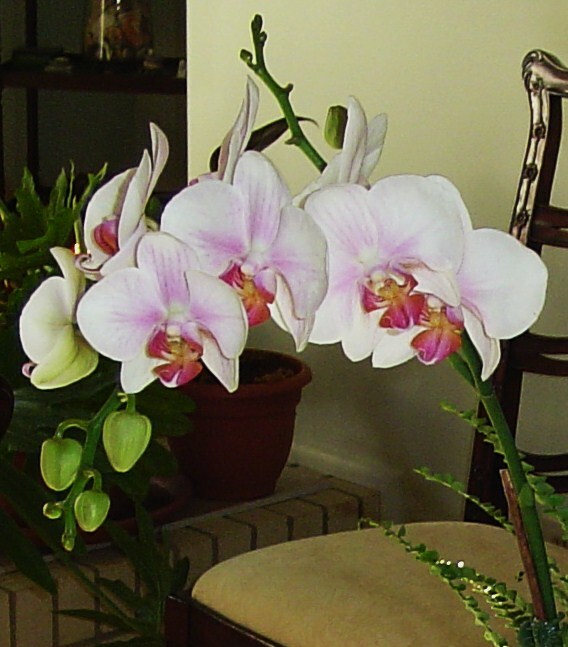 To rebloom, orchids require sufficient light, sufficient water, sufficient nutrition, and a difference of about 20 degrees between daytime and night time temperatures for several weeks. Lacking any of these, they may not set buds. 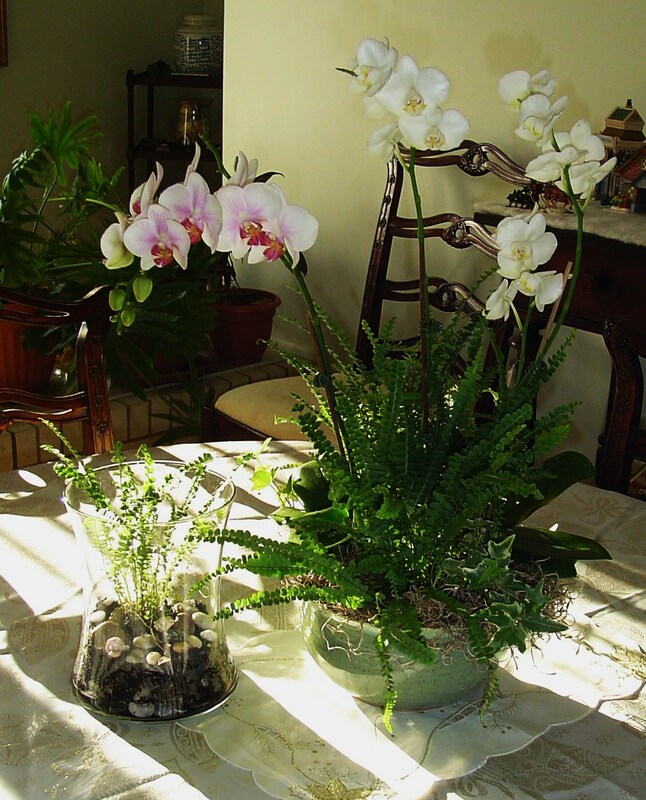 Moth orchids appreciate bright sunlight, but can’t take a day of direct sunlight. They need a bit of shading, especially in summer. 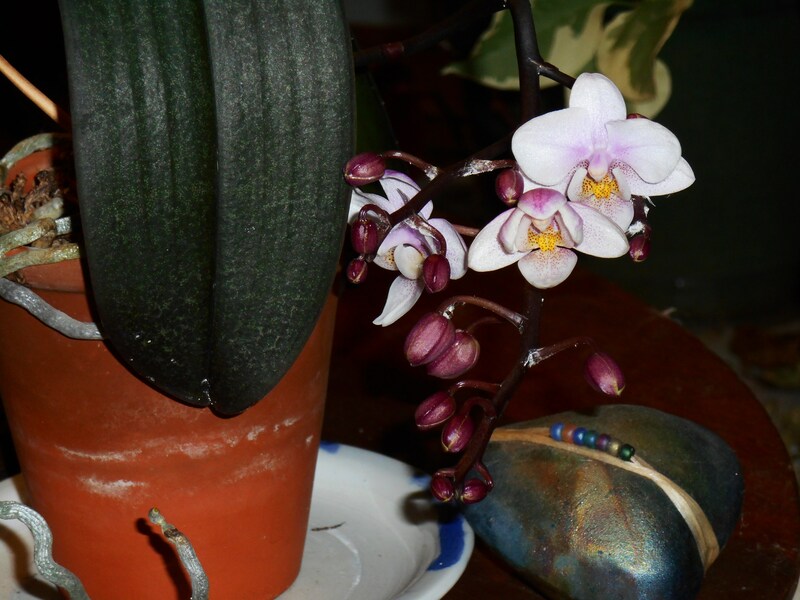 If the leaves of your orchid begin to elongate, or turn very dark green, it is an indication that more light is needed. Orchids on display, away from bright lights, need to be moved back into the light to recover when the display is dismantled. Most growers plant orchids in sphagnum moss. While the moss holds the roots in the pot ( or more likely in a little plastic drinking cup), the moss offers the plant little or no nutrition. 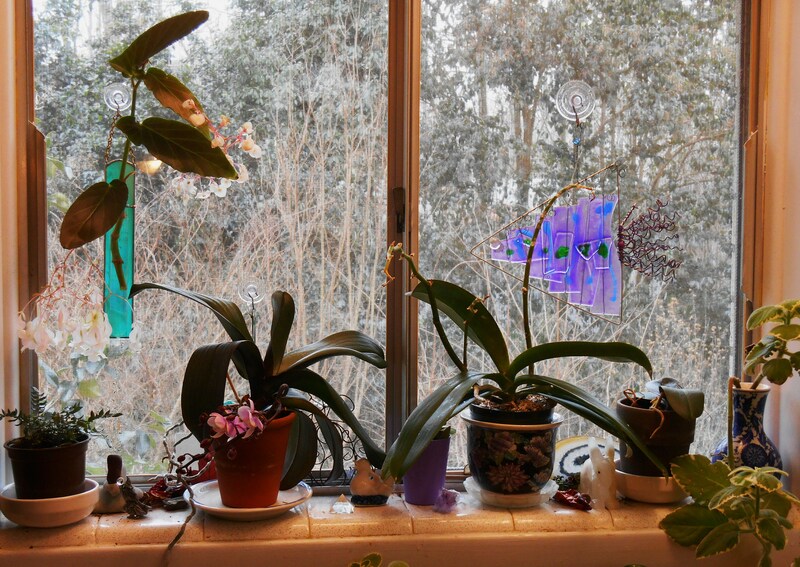 I’ve found that keeping the orchid in a west or northwest facing window, keeping it moist, and feeding with a dilute solution of orchid food will allow it to rebloom. Leaving the bloom scape in place, once the actual flowers have fallen off, may hasten reblooming. More than once, new buds have formed on an old bloom scape. 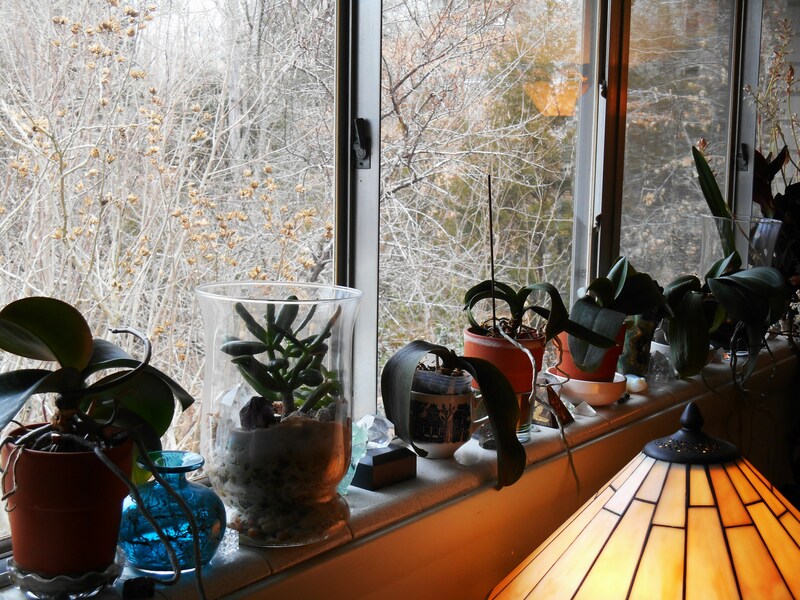 This west facing window is my best window for bringing orchids back into bloom and for rooting cuttings. 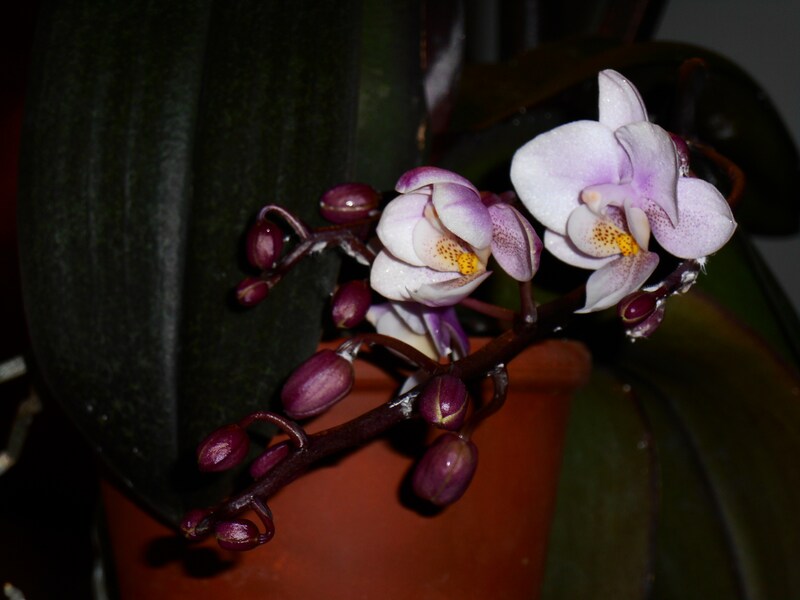 Although most of an orchid’s roots remain in its pot, Phalaenopsis will also grow silvery aerial roots. These roots can absorb humidity directly from the air. They would normally help anchor the plant on the branch of the tree where it was growing. If you move the moth orchid out of a pot into a wooden basket, or onto a branch of wood for display, these roots will help anchor the plant in place. I like the unusual appearance of these roots which grow as the plant matures. Many orchids respond well to a good soak once a week or so, and then several days to dry a bit before the next watering. Orchids require a little more water while buds develop to sustain their blooming, and less water during their period of rest. Most orchids are purchased while in bloom, and the bloom scape is supported by a thin stick of wood or wire. Little spring loaded clips hold the bloom scape against its support. When the bloom is finished, I remove these supports, and save them for use again later. The bloom scape doesn’t naturally grow straight up for a tall display of blossoms. When the plant begins to grow a new blooming stem, you might want to replace the support and gradually train the scape up the support. If you leave it to its own devices, it will probably grow horizontally, or even hang down under the weight of the flowers. Green porcelain bowl purchased from the artist at Bella Fiore on Ocracoke Island, NC. Orchids can be displayed in a variety of ways. While they look pretty even in the little nursery pots they are purchased in, I also like to work them into more elaborate arrangements. 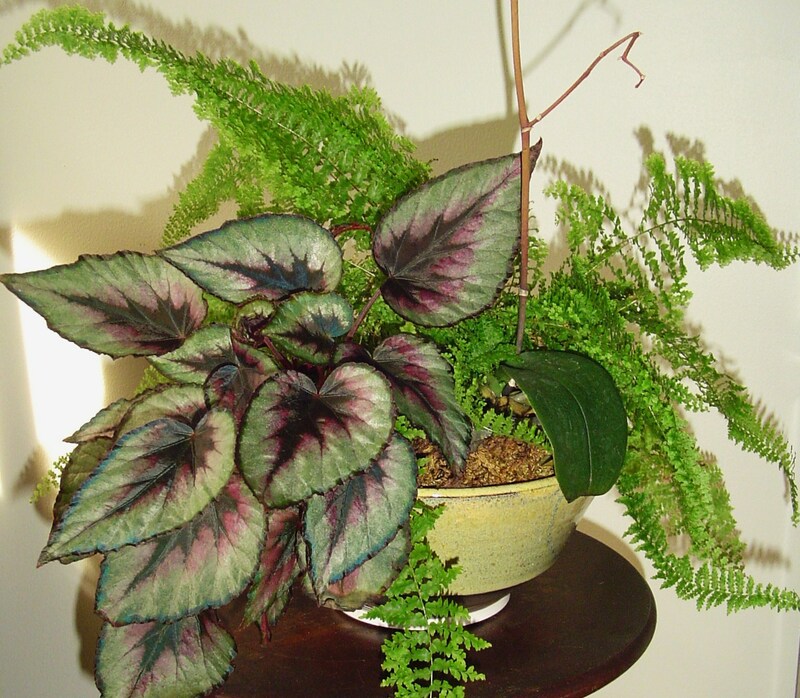 I will sometimes construct an arrangement with ferns, ivy, small Rex Begonias, and orchids in a pretty bowl. While the other plants are removed from their nursery pots and planted into potting soil in the bowl, I leave the orchid in the little plastic cup from the grower. With a base of gravel in the bottom of the bowl for drainage, I’ll leave space to set the orchid, in its cup, on the gravel, and then fill in around it with small stones and potting soil. 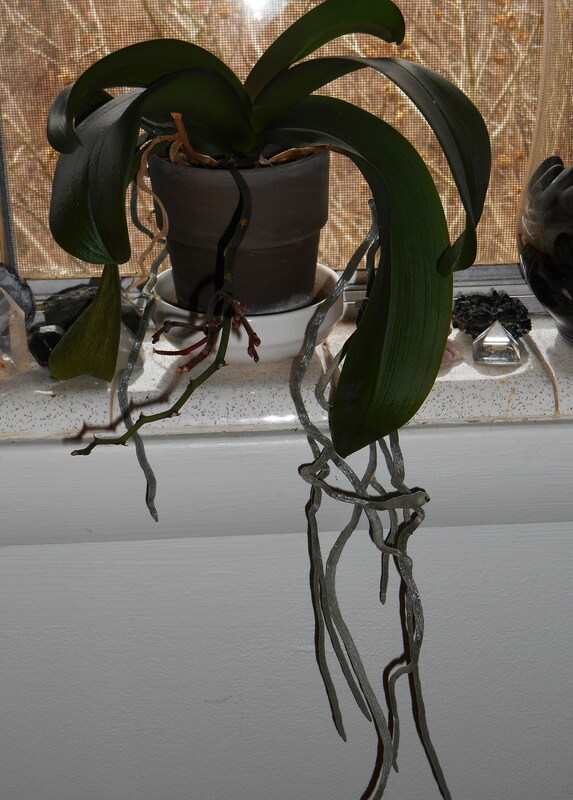 It is important that the orchid get good drainage. It shouldn’t sit in water or overly damp soil. This allows you to have some control over how much water you give the orchid, versus how much water the other plants in the arrangement get. 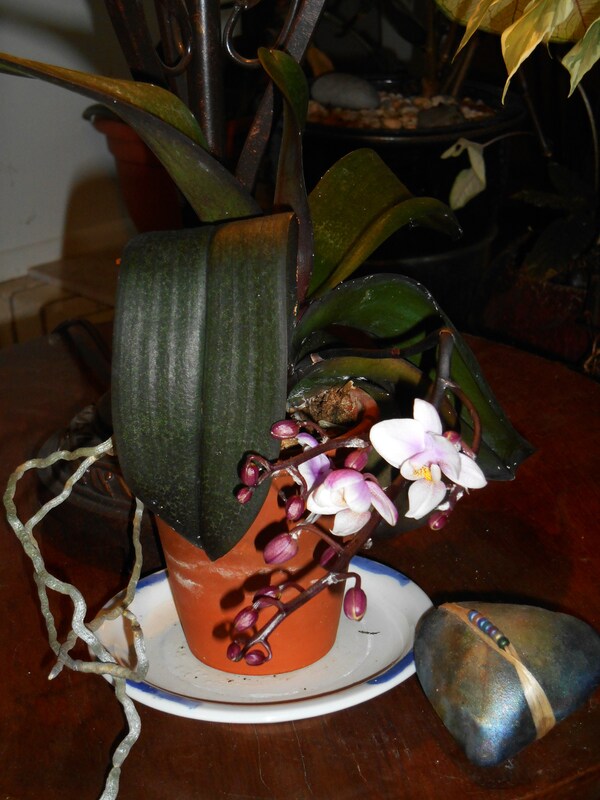 In several weeks, when the orchid has finished blooming, it is easy to pull the plant out in its cup. The orchid can go in a window sill to rest and recover, and you can pop a fresh orchid into the arrangement to keep it fresh. A blooming orchid is such a special joy during winter. My eye always turns towards the orchid display in January and February, when very little is blooming out in the garden. During this stark season, when the world has melted into browns and greys, a bright orchid brings so much energy and freshness. Orchids demand very little from us, and bring such happiness. If you don’t already have an orchid in your home, I hope you’ll consider adopting one to bring flowers back into your home for the remainder of the winter. Hi woodlandgnome! Earlier, I typed and left a comment here to inform you of something important: a new post that I just publish and its weblink. For some reason, the comment just disappeared after I submitted them. This is quite disconcerting. It seems that if any reader of your blog were to leave a comment containing one or more weblinks, their comment will disappear. You might want to consider changing the settings. Otherwise, I or any other reader will have no way of sharing or informing you of certain useful links to their posts or other sources. It would be prudent to check whether my earlier comment has been put into your spam list due to your setting(s). You can resurrect the comment by unspamming it. It may also be relevant to check your Discussion Settings and also Comment Moderation. Thank you in anticipation. 2017 Annual Show of Begonias for a Burst of Colour. Please kindly let me know whether you are interested in taking up my offer. Thank you in anticipation. Of course , I would be very happy for you to share it with your readers . We seem to share a love for beautiful and unusual flowers . Thank you for visiting Forest Garden again . May you enjoy reading the new post! I look forward to reading your feedback at the comment section near the bottom of the new post. Wonderful story! And beautiful photos! You are very welcome! WG!! Have a great night there! Very good information. I had not taken the time to learn so my suffered.